“Above all, my brothers and sisters, do not swear—not by heaven or by earth or by anything else. All you need to say is a simple “Yes” or “No.” Otherwise you will be condemned” (James 5:12). 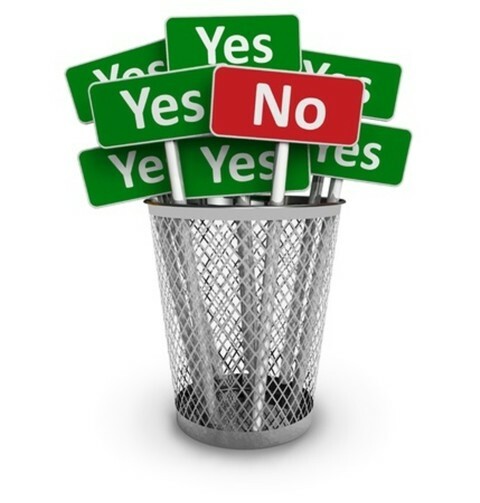 Why is it so difficult for us to simply say yes or no? Perhaps because we like the ambiguity of not having to follow through with what we say. Or maybe because it’s easier to put off a tough decision for a later time. We may flirt with tendencies towards deceitfulness and not want others to know our true intentions. Whatever the reason, God expects His children to be clear cut with their words. We aren’t to wade in the subtle grey areas of ambiguity with our words. Rather we are to be people who speak plainly, clearly, and truthfully so that we aren’t condemned by our own words. This type of swearing isn’t about using profanity although scripture clearly condemns using coarse language especially among believers. Swearing in this scripture is about making oaths or promises to others. Why would believers need to make promises if we are living righteous lives? Having the urge to swear reveals someone who may feel they have to prove themselves to others. Perhaps they have a sordid past of not telling the truth and other people find it difficult to trust them. There’s really only one remedy to this: begin a life of truthfulness. Confess your past failings and seek forgiveness. Know that you are a new creature in Christ Jesus and not limited to the failings of your past. It was a common practice among the Jews of Jesus’ day to make promises based on objects of the earth and not on the name of God. They did this primarily as a way out just in case they broke their oaths. They believed it wasn’t a matter of judgment as long as the promise wasn’t made in His name. The Lord is displeased when we don’t keep our word whether we swear by heaven or not. Jesus’ point was that we don’t even have the power or authority to make oaths. The Lord is displeased when we don’t keep our word whether we swear by heaven or not. The easiest way to avoid this behavior is to simply say yes or no to what you will do or not do. Does God really care about our promises? Absolutely! As children of the King, we represent our spiritual family by our words and actions. In Matthew 12:36-7, Jesus said, “But I tell you that everyone will have to give account on the Day of Judgment for every empty word they have spoken. For by your words you will be acquitted, and by your words you will be condemned”. One day we will have to give an account for our broken promises—wouldn’t it be easier to live and speak words of integrity? When we speak the truth in love, our righteous actions will speak volumes to those who depend on us. Honor is given to God when His people keep their word and judgment is deferred. Paul wrote about how the people in the world speak “in the same breath…both ‘Yes, yes’ and ‘No, no’ (2 Corinthians 1:17). We expect this from those who live in darkness and can’t understand a world outside of what they see with their eyes. However there is hope in Christ as God is not like man and keeps every one of His promises. As it is written: “For no matter how many promises God has made, they are ‘Yes’ in Christ. And so through him the ‘Amen’ is spoken by us to the glory of God” (2 Corinthians 1:20). Because we have this hope of “Yes and Amen” in Christ, we should live as people of faith who mean what we say and follow through with our lifestyle. Believers are walking testimonies of God’s faithfulness without saying a word. Let us start today with “yes” and “no” to the daily requests from others without adding any promises to it. I really appreciate this article. I’m preaching on James 5:7-12 tomorrow, and came across this. At first look V12 seems to be out of place with the rest of the verses, but it fits so perfects with the rest of the book on taming the tongue. I would like to quote you in a small portion from your article in my sermon. Thank you for the help. Thank for your article is aliving basis, the essetials parts or facts; it’s the simplest principles. keeping to your word in obedience. That is what i call in Matthew 5:37 electrocardiograph of the writen word of God in our heart as a diagram or tracing of the root of heart promise to a love one. It make sense to avoid the pain to others by keeping the promise in heart. Yes, no matter the trials. Thank you for your words of wisdom dear one. Blessings abound. Are we making vows when we sing in worship? For example “even in the valley I will dance with joy”. It seems to me are, and most of the time are not aware of it, which is no excuse for not keeping the vow. Thoughts? Previous post: Was Judas Saved?